Growing up in rural North Carolina during the 60’s and 70’s, reading was a big deal for me. Back then, it was still one of the chief forms of entertainment since cable television was pretty much unheard of in my neck of the woods. And, while the internet existed, it wasn’t available to peons like us. So, books were important. In the earlier days of my childhood, getting books often meant going to the library. That required a trip downtown, as the Greensboro Public Library didn’t have branches until the late 70’s. Considering that my family only had one car until I was 10 years old, trips downtown didn’t happen all that much. Of course, that only made a visit to the library so much better. But, just because we didn’t make it into town all that often doesn’t mean reading material was lacking. There was also the Bookmobile. For those of you to young to remember, the Bookmobile was basically a library on wheels that brought books to people who might otherwise not be able to get them. The one I remember was a converted city bus fitted with shelves filled with books. It had a route and came to various neighborhoods on a regular schedule. It appears the Bookmobile is a thing of the past in this digital age where anything you might want to read is just a click away. That’s more than a little sad because the Bookmobile was awesome. 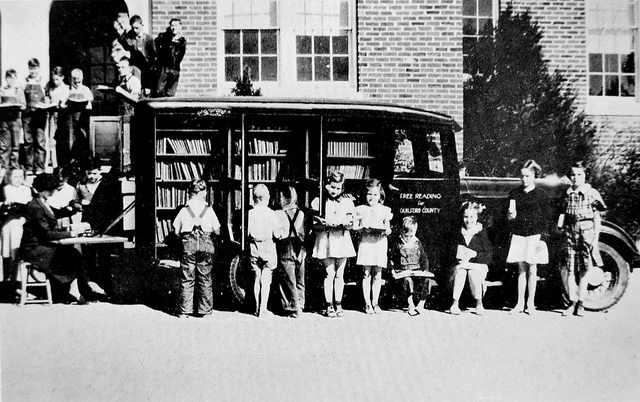 Back then, a visit from the Bookmobile was more than just a chance to get something new to read; it was a social event that bought the community together. We would gather at a friend’s home on Old Randleman Road and, while the mothers socialized((i.e. shared the latest gossip)), we kids engaged in our own form of socialization, usually involving a ball of some sort. As a rule, a game was struck up as soon as we had enough people to play and lasted until the Bookmobile arrived. At that point, any and all play came to screaming halt((it did for me, anyway. I’ve always preferred a book to ball since a book didn’t require a level of coordination that still escapes me)) and we all made for the door. I always wanted to be first in line because space was limited and only a few people could browse the shelves at any given time((waiting has never been my forte)). Plus, I wanted first crack at whatever books were available. The thought of someone getting to a Freddy The Pig book I hadn’t read before I did was almost more than I could bear. But, no matter what I was able to get hold of, I was ecstatic: I had books to read. Whatever else happened was small potatoes compared to that. For some people, my literary zeal is hard to understand. More than once in my life, people have asked why I love to read so much. I can think of two reasons: first, my parents understood the importance of reading and made it a priority in our household. Before I learned to read, my mom or dad read to me every day. After I learned to read, they always made sure that books were always available and encouraged me to read. Second, reading was an escape. I’ve told you that my childhood wasn’t exactly rosy; between being a certain s.o.b.’s whipping boy and huge nerd, I needed a way to step outside my reality in order to keep sane; books gave me that opportunity. And, not just while I was reading them, either. I spent many an hour inserting myself into the stories I read to further escape the shittier things in my life. It’s something I still do to this day. I love technology and the idea that I can download books for free from the library or a certain website that shall remain nameless((in deference to some of my author friends who have “issues” with them)) is absolutely amazing. In fact, I think the ready availability of books is the best thing the internet has done for the world. But, at the same time, I can’t help but feel a little sad for the passing of things like the Bookmobile and paper books((face it, e-books are the wave of the future)) because many of my favorite memories involve books (or getting books) and, in my humble opinion, young people are missing out on something special. But, it’s up to them to make their own memories and it’s up to me to understand that their memories are going to different from mine. Is it hell to get old? Maybe, but it beats the hell out of the alternative.